Catch up on the latest news, issues and events regarding Guildford Greenbelt Group. So cosy is the relationship between Guildford Borough Council and a Cayman Island developer that wants to build 2,000 homes on Greenbelt outside the town that it allowed the developer's agents to write a letter in support of the scheme disguised as being authored by the leader of another council. The Guildford Greenbelt Group (GGG) is the only established local party that has stood up for protection of our countryside, our town and our environment. We are a genuinely local party, with no control from national groups – no other party can say this. We oppose big party bullying and will work with independent councillors. More local voices are needed to stick up for local interests. We work with residents’ groups – our party grew out of residents’ groups and parish councils. Government housing policy has lost all contact with planning Britain’s countryside. This week the Campaign to Protect Rural England is up in arms over house-building in green belts, and over the lack of what it calls affordable housing. These are a distraction. It is planning as such that has collapsed. The CPRE is concerned that 8,000 houses were built last year on green-belt land, or 24,000 over the past decade, and that hardly any were affordable. This has predictably raised a green light over all green belts, with developers rushing forward with applications for 460,000 new homes now in process. Already, unplanned and sprawling “toy-town” estates are spreading across the home counties, the Fens, the Somerset Levels and the Severn Valley. It has sucked development into the south-east of England, denuded town centres and put ever more pressure on transport corridors. It is the worst sort of “non-planning”. The Secretary of State has turned down plans to build 2,000 homes on the site of the former Wisley airfield at Three Farm Meadow. It comes as a blow to Cayman Island-based developers Wisley Property Investments Ltd. It had appealed after Guildford Borough Council had originally refused planning permission in 2016. The planning inspector decided harm to the green belt and lack of suitable infrastructure outweighed the provision of new homes. Councillor Susan Parker, of the Guildford Greenbelt Group, echoed this point, saying: "This is a triumph for local people against offshore developers seeking to destroy our countryside. The grounds for refusal will apply to almost all green belt sites allocated for development in Guildford's Local Plan". Up to five new garden towns are to be approved for the corridor between Oxford and Cambridge under government plans to launch a “housing revolution” this week. In an interview with The Sunday Times, Sajid Javid, the housing secretary, said he would give the go-ahead to at least two new towns in the next few weeks and could push for up to three more. The decision comes after ministers agreed to fund a high-speed rail line and an “expressway” for cars between the two leading university towns. “Along that corridor, there’s an opportunity to build at least four or five garden towns and villages with thousands of homes,” Javid said. The first step will be to establish “new town development corporations” for the chosen sites, which will help developers and town planners to “cut through a lot of the bureaucracy”, he said. On Saturday 3rd March, Jerome Starkey, Countryside correspondent for The Times reported that CPRE (Campaign for the Protection of Rural England) and Shelter (charity for the homeless) commissioned a study to look at the number of affordable houses delivered by 150 developments versus the number promised at planning submission. The study revealed that the number of affordable homes built was cut by almost half (48%) as developers were able to use a confidential viability assessment which permits them to reduce the number if they can demonstrate insufficient profit. The confidentiality factor means that it cannot be readily challenged. At the same time, the profits of the three biggest housebuilders quadrupled since 2012. The article confirmed that the term 'affordable' does not mean affordable for many local people. The result is that the English countryside is being used to boost developers profits without providing the level of affordable housing that is needed. Sajid Javid has promised a review of how viability is assessed. GGG poses the question; as the countryside diminishes and homelessness increases, shouldn't loopholes that feed the problem be dealt with and shouldn't the policies that exacerbate the problem be changed forthwith? England is losing an area the size of Glasgow every year because of a record number of developments on greenfield land. Forests, fields and parks are disappearing under concrete at the fastest rate for a quarter of a century, an investigation by The Times has found. On average, 170 sq km of greenfield land were built on every year from 2013 to 2016 after the government relaxed planning rules to ease the housing shortage. The problem of inflated prices lies in property speculation. That’s what we need to clamp down on. Everyone – from the government to housing charities, to housebuilders – has bought into the conventional wisdom that the dysfunction that racks our housing market is a matter of demand and supply. We’re not building enough houses, so house prices have been sent rocketing, taking home-ownership out of reach for growing numbers of young people. But in reality, our housing problems are not a simple feature of supply and demand. Rather, our housing market has a Bitcoin problem. The green belt in England is being sacrificed to build new housing at the fastest rate for two decades, according to environmental campaigners. The number of homes planned for the rings of protected land around towns and cities has risen by 150,000 in a little over a year. Almost 425,000 are now due to be built in the green belt, up by 54 per cent since March last year, according to analysis of local authority plans by the Campaign to Protect Rural England (CPRE). Communities face a postcode lottery over how much of their countryside is blighted by new homes because some councils fail to use powers to protect it, research has found. Some local authorities choose to protect their green belts but others accept much higher housing targets and allow developers to build on environmentally valuable land. The different approaches mean some areas are being earmarked to have thousands more homes than necessary, according to research by the Campaign to Protect Rural England. Councils are planning more than 360,000 homes on England’s 14 green belts, which are rings of protected land designed to prevent urban sprawl. 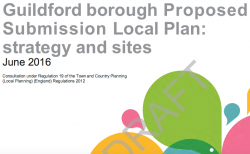 Susan Parker, leader of GGG, challenged Guildford council Executive to fundamentally review its proposed Local Plan. "This council urgently needs a Local Plan which is fit for purpose. 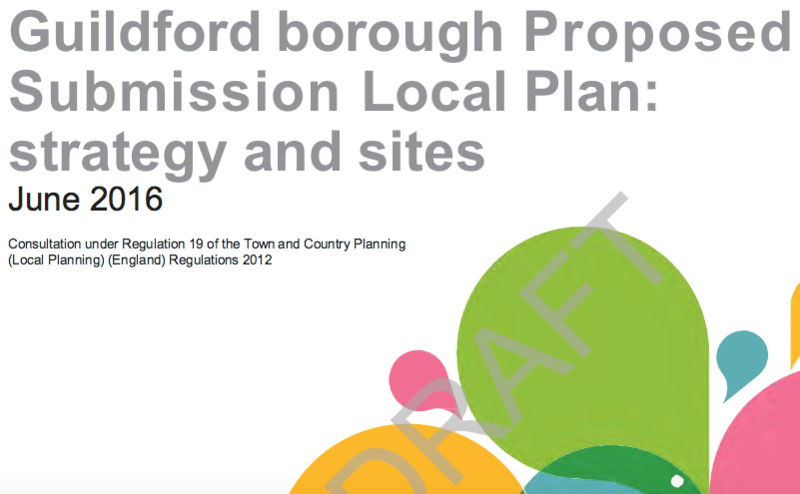 GGG has argued - since before the first draft of this plan came to consultation - there are fundamental problems here. 32,000 replies to the last consultation confirmed the people of Guildford agree with us and meant that the plan had to go back to consultation." Sajid Javid pledged the Green Belt was 'sacrosanct'. To betray that now would be sheer vandalism. Only last year my colleague Sajid Javid, the Communities Secretary, stood up in the House of Commons and described the Green Belt as ‘sacrosanct’. It was the right word to use. Despite vowing in the Conservative 2015 Election manifesto to protect the Green Belt, all the signs coming out of Whitehall are that Ministers will use the new Housing White Paper to find a back- door route to concrete over our glorious countryside. The timetable for the appeal [APP/Y3615/W/16/3159894] by Wisley Property Investments in the matter of Guildford Borough Council's refusal of planning permission for "Outline planning permission for the phased development of a new settlement of up to 2,068 dwellings" [15/P/00012] at Three Farm Meadows, Hatch Lane, Ockham has been released to interested parties. Highways England [HE] opens consultation and want your views on their plans to improve the M25 junction 10/A3 Wisley interchange to tackle issues including congestion, capacity, safety, noise and environmental impacts. Despite a looming deadline for all councils to write an up-to-date local plan by early next year — or face having it done for them — two in three have not yet adopted one. Green-belt councils such as St Albans, in the 14 rings around English cities where building is restricted to curb sprawl, are further behind: 70% of them lack one, according to exclusive data from planners at Nathaniel Lichfield & Partners. So what is the government’s stance? Will it propose the rumoured swaps of ugly green belt for new protected land in its long-awaited housing white paper, now delayed until January? Ministers are preparing to relax the protection of green belt land as the government struggles to meet targets for housebuilding, it was claimed yesterday. Sajid Javid, the communities and local government secretary, was said to be ready to encourage councils to allow more housing developments on green belt land provided that they created areas of protected land elsewhere. Such a move, known as green belt swaps, would represent a huge change in planning policy and a shift by the government. It would provoke fury from environmentalists and countryside campaigners. Wisley is the biggest of four main sites in the green belt earmarked by Guildford council’s draft local plan, which together account for 58% of its proposed 13,860 new homes by 2033. They also include Blackwell Farm, next to the Hog’s Back, part of the North Downs, from which Jane Austen wrote that she had never seen the country “so advantageously” — but where the expanding University of Surrey plans to build 1,800 homes. The local response? Residents storming out of planning meetings with cries of “Shame on you”, and about 32,000 comments from 6,000 individuals on the local plan in July — among the highest in the country for such consultations. This is the new green-belt inkblot test: do you see fields worth saving or development opportunity? The popular interpretation of this is it is all about supply. There just isn’t enough. That then makes the solution obvious to everyone: build more houses. “The way you get affordable homes is to build more homes,” says George Osborne, the chancellor. But once you start to look at things properly (and sign up to Uber) it is obvious that this isn’t quite right. Look at rents. If there just weren’t enough places in the UK for everyone to live, rents would be rising as fast as house prices — and the rental yields that investors get wouldn’t be falling. That’s not what’s happening. Fathom points out that house price inflation has trumped rental inflation by 2.3 per cent a year since 2006. The Housing and Planning Act 2016 is published today which will impact all communities involved in an emerging Local Plan, especially ones like Guildford. When appearing to not realise her microphone was still turned on, councillor Marsha Moseley made the controversial comments. A Guildford councillor has been filmed branding the public "a bloody rabble" during the heated Wisley Airfield development meeting. Councillor Marsha Moseley also labelled residents "badly mannered", when chairing the debate on Wednesday evening (April 6). Guildford Borough Council (GBC) has published its revised Local Plan that is intended to shape the future development of the borough over the next two decades. Agency reportedly worth £1.2bn and brought in a surplus of £100m in 2012/13. The Government has quietly announced plans to privatise the Land Registry, on the evening before the Easter holiday weekend. The Conservatives previously tried to privatise the agency, which records and oversees all property transactions in England and Wales, during the Coalition government but were blocked by the Liberal Democrats. Chancellor George Osborne revived the idea last year as part of his plan to sell £20bn of assets by the end of this parliament. The agency has been previously valued at around £1.2bn and made a surplus of £100m for the public purse in 2012/13. The leader of the Guildford Greenbelt Group - Susan Parker, calls on Guildford Borough Council to scrutinize the all-important housing number suggested by property consultants GL Hearne. Councillors however, rejected the proposal for reasons which will leave many residents open mouthed. Setting a housing target for our borough is probably the most important decision Guildford Borough Council will take over the next decade. How many homes should we build? The decision will affect how our borough looks and what it will be like to live in for the foreseeable future. There will be no going back. At the council’s Overview and Scrutiny Committee, last week, I proposed that the committee should scrutinize the assessment of housing need as set out in the the Strategic Housing Market Assessment or “SHMA” and the derived housing target. Developers would be allowed to build thousands of homes in the green belt in return for paying a levy to enhance the remaining land, under a proposal from leading landscape architects. The levy would pay for creating parks and woodlands in England’s 14 green belts, which are rings of protected land around cities designed to prevent urban sprawl. Something is wrong with the planning system, reports the Oxford Mail. Silly housing targets let developers get permission to build executive homes in rural villages where little, if any, expensive infrastructure, like new roads and schools, has to be paid for. Few existing residents can afford them and it isn’t going to create homes for our children. The Oxfordshire Strategic Housing Market Assessment is fantasy and not soundly-based or supported by robust and credible evidence. Fairview New Homes are proposing to build on Green Belt land on Enfield Road (EN2 7HX). For many years this land has been used for grazing horses and is the habitat for a wide variety of wildlife, including hedgehogs, bats, muntjac deer, pheasants, owls, woodpeckers and many species of birds. It also contains beautiful specimens of ancient oak trees and hedgerows. THIS IS ALL NOW UNDER THREAT. Councils have a public duty to estimate housing need. Guildford has delegated this calculation to a property consultancy called GL Hearn. Guildford has not disclosed the detailed arithmetic and assumptions to show how the housing need for the borough was calculated and even professes not to hold a copy of the model. Guildford's Code of Conduct pays lip-service to 'Openness', 'Transparency', and 'Honesty'. Failure to oblige contractors and consultants to disclose their calculations to the public is not consistent with these values. Nor is it an acceptable method of conducting public affairs. It is not consistent with the principles of good public procurement contracting. Failure to explain in detail the assumptions and arithmetic behind the housing need estimates which underpin the Local Plan is a dereliction of public duty. GL Hearn apparently subcontracted the work to Justin Gardner Consulting. GL Hearn claims to have worked for some 250 planning authorities across England. Failure to disclose may therefore be widespread. When queried with the Information Commissioner's Office, the ICO decision can be found here. This has led local resident Ben Paton to initiate an online petition "Councils must publicly disclose housing need calculations in Guildford and across England" seeking local support to for Guildford council to reveal how the Objectively Assessed Need in the West Surrey Startegic Housing Market Assessment was derived. Britain’s nine biggest housebuilders have landbanked 615,152 housing plots that have not yet been developed – four times the total number of homes built in the past year. The top four firms – Berkeley, Barratt, Persimmon and Taylor Wimpey – also hold £947million of cash, according to a investigation by The Guardian.